When I drove my sisters back to town from the lawyer’s three days after our father’s death, it took a while for us to arrive at the subject of his women. The lawyer had given us a rundown on the will—no surprises, 20 percent to each of us, a little more to his final companion and a little less to his two stepdaughters from his second marriage. We knew that his estate, which included a parking lot in a commercial district in Tokyo as well as a summer house near Mount Fuji, was considerable. Yet none of us had any idea where the right documents were, and for some time our conversation shuttled from where to look for them to what kind of service to hold to how to clear the house of its clutter to when to see the body and how best to lay it to rest. 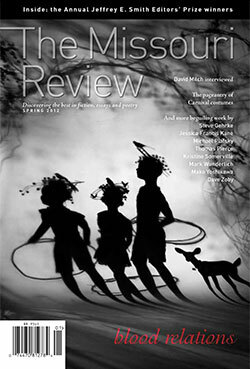 35.1 (Spring 2012): "Blood Relations"
Featuring the winners of the 2011 Jeffrey E. Smith Editors’ Prize, as well as work by Steve Gehrke, Jessica Francis Kane, Thomas Pierce, Mark Wunderlich, Mako Yoshikawa, and Dave Zoby… and an interview with David Milch.